The 1980 eruption of Mount St. Helens is regarded as the deadliest and most destructive volcanic blast in U.S. history. And yet, just thirty-three years later, life has returned to the area in almost equally impressive force, as newly released photographs illustrate. The eruption produced staggering quantities of gas and ash. The lethal combination emanated quickly outward in a pyroclastic flow that choked the life from more than 230 square miles of Washington state forest and killed more than fifty-seven people. 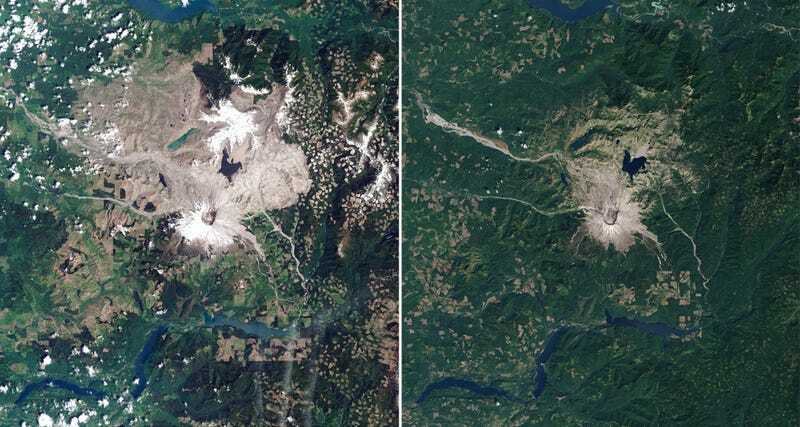 The aerial photo above, on the left, was taken four years after the eruption. Released earlier this week by NASA, it illustrates the extent of the devastation wrought by the blast on surrounding vegetation. But the photo on the right, captured just a couple months ago, illustrates the region's dramatic comeback. "Life has bounced back," writes Andy Coghlin over at New Scientist. "Even in the immediate wake of the blast, biologists found live seeds and spores in the fallout zone and noted the return of gophers and ants that had found sanctuary underground." In terms of vegetation, first came mosses, then grasses, shrubs and trees. Along with them came insects such as caterpillars, enabling the return of birds and animals that feed on them. Now, there are 10 million trees on the slopes, and 1750 elk, almost matching pre-eruption populations. We often think of nature as this fragile thing, incapable of looking after itself. Photographs like this illustrate just how robust nature really is.